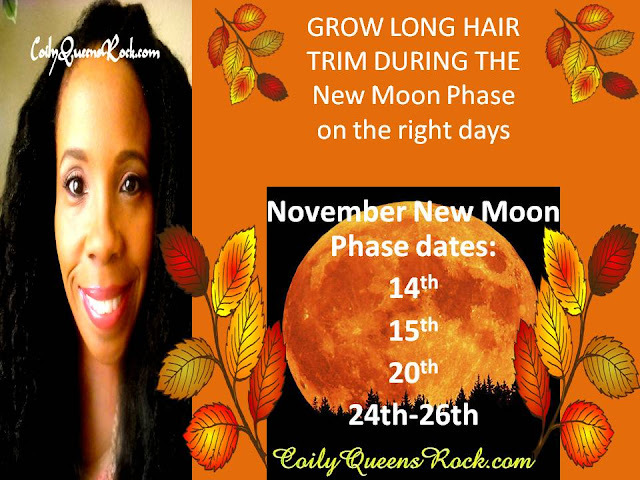 Trimming your hair on days in which the Moon is giving out the strongest energy. This happens within the new moon second quarter phase as the moon is waxing. Is this some type of witchcraft? No, there is no chanting involved. There are no spells to recite. No candles to burn. All you do is trim your hair on the right days. Do I have to cut my hair every month? No, you decide how often and how much you need to trim. Just follow your regular trim routine, but trim on the right days. Do I have to cut my hair at night? No, you can trim your hair anytime on the right day. Morning, noon, evening or night. When I do a search for New Moon hair growth I get different dates from each site? Why? Different sites will list varying days for growth increase. People use slightly different methods for choosing their days. You have to decide which dates you will follow. I know that my dates work, from the many testimonies I receive via email and facebook. I choose my dates from the lunar calendar and Spiritual discernment. I then share these days with you. This is just one of many updates from my subscribers. Subscribe to this blog so you can receive the New Moon Phase dates each month.